The values of the third rail relate to the values on the front part of the rubber, vertical to the value on the wooden rail. The spaces between the values of the third rail are sometimes irregular. The values in brackets show the real distances from the short rail. I.e. the value 0 which is relevant for the calculation is at 0,6 diamonds distance, or 6 units from the upper short rail. The value 40 is at 3,7 diamonds or 37 units from the upper short rail. The value 0 on the 1st rail is in the continuation of the front part of the rubber of the short rail. The value 00 is exactly in the corner of the wooden rails. B 1 is hit slightly below center with much running English. The speed should be chosen in a way that B 3 (for rail first shots B 2 and B 3) should at least be moved 40 cm from their position. The stroke should be executed as standard stroke, meaning neither extremely smooth nor attacking. Estimate the arrival on the 3rd rail. In our example it is 30. Choose a possible start value and insert it into the formula. 50 - 30 = 20. The result of the calculation is the value on the 1st rail. Now imagine a line from the chosen start value (50) to the value on the 1st rail (20). If you realize, that this line is far away from the cue ball, you try another start value and insert it into the formula. 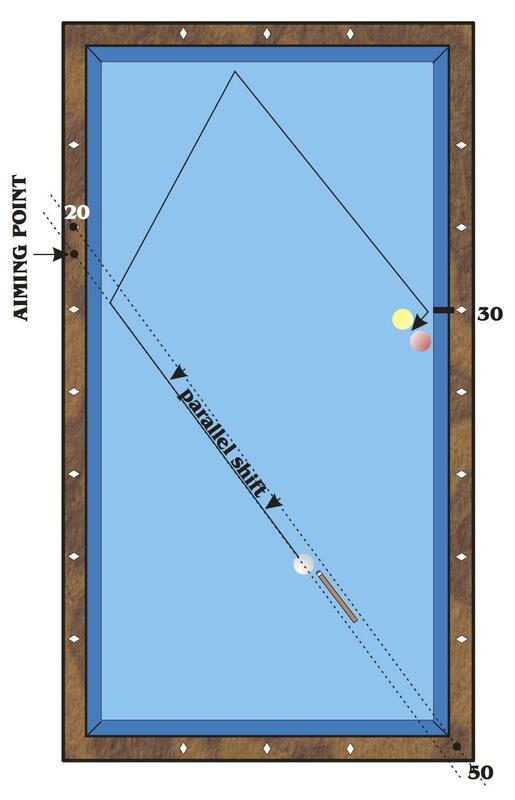 If the line is close to the cue ball (less than 5 cm), you just shift it parallel, till you cross exactly the center of the cue ball. The point where this line reaches the first rail is your aiming point. If we speak about the path, we mean the corresponding lines between the 3rd and the 4th rail. 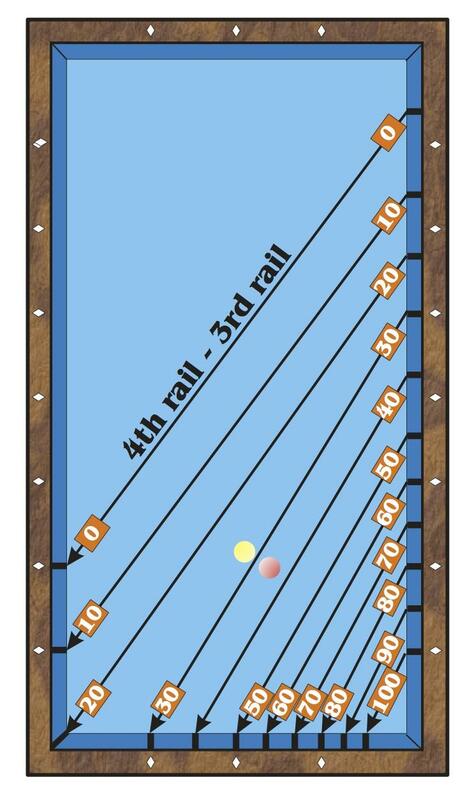 If you calculate and play a stroke to the 3rd rail, the paths show you where the cue ball touches the 4th rail. This is also the reason why the values of the 4th rail match the values of the 3rd rail (as shown in the diagram). 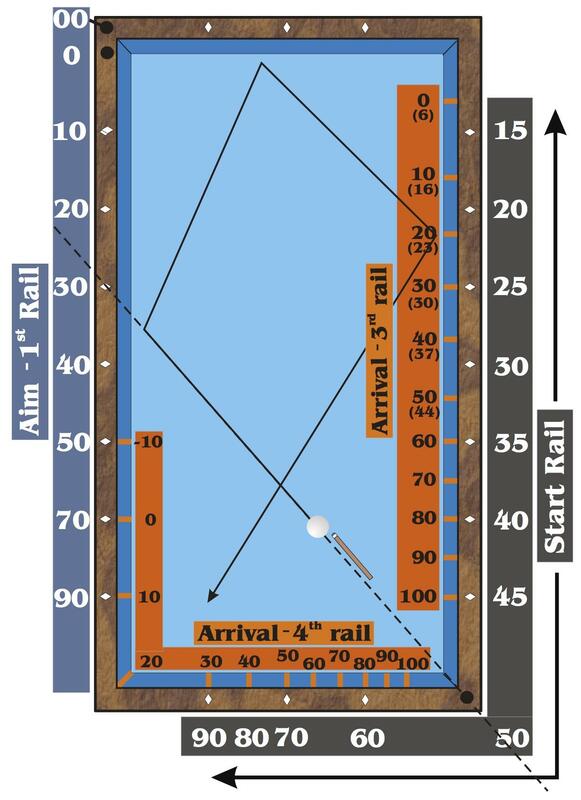 The path from the 3rd rail to the 4th rail is to some degree depending on the start value. This is called the correction of the paths. The numbers in brackets that you find below the start values show the respective correction value. Looking at the diagram, you will understand the importance of this correction. In both cases we arrive at 30 on the 3rd rail, but starting from 40 the path from the 3rd to the 4th corrects by -1 (arrival on 4th at 29), starting from 70 the path corrects by +5 (arrival on 4th at 35). Be careful! The correction of the path only concerns the arrival on the 4th and not on the 3rd rail! Before you start your practice unit or a game you should play the following four lines. 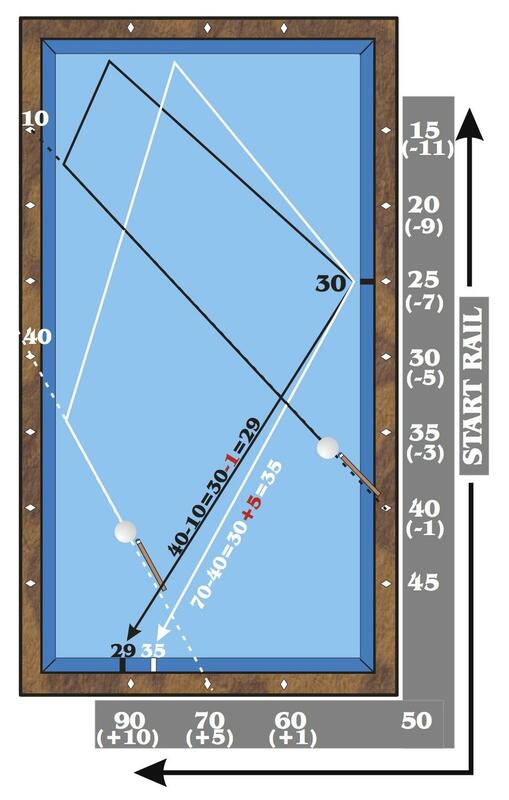 The actual arrival values on the 4th rail enable the player to integrate the characteristics of the table into his calculation.